A big shout out to Dr. Don MCanne for his Quote of the Day post Friday for today’s topic, and a belated shout out to him for his post last Tuesday about the gains from the ACA being reversed. See my post, ACA Gains Reversing. This time, Don alerts us to the impact the new health economy disruptors will have and what it might mean for the push towards single payer health care. Last month, the PwC Health Research Institute (HRI) released a report analyzing the new health economy landscape as more and more companies pursue acquisitions of companies in the insurance, pharmacy benefit management, health care services and retail spaces. In the last six months, the report states, there has been an explosion of unusual deals between companies such as CVS Health buying Aetna, Cigna buying Express Scripts, UnitedHealth’s Optum buying DaVita Medical Group (Kidney disease and dialysis), Albertsons agreeing to merge with Rite Aid, as well as the much highly publicized partnership between Amazon, JP Morgan, and Berkshire Hathaway. Naturally, these aren’t the only deals that have occurred. Last year, 67 deals occurred in the US health services market, including payers and providers, the report adds. The value of these deals increased 146% over those in 2016. The US health care industry, the report states, is undergoing seismic changes generated by a collision of forces: the shift from volume to value, rising consumerism, and the decentralization of care. This is how Don McCanne commented on this report. 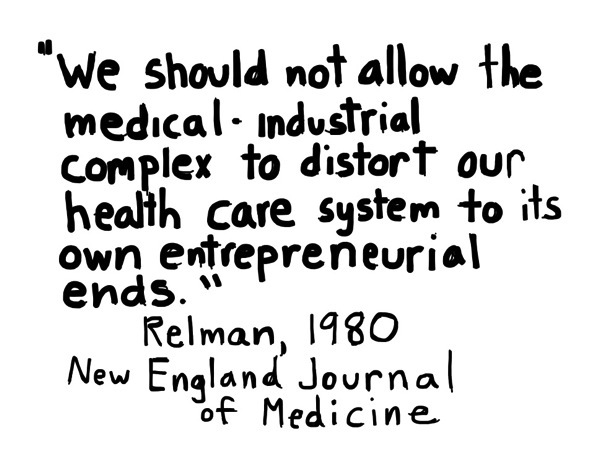 He wrote that Arnold Relman, like Dwight Eisenhower did about the military-industrial complex, warned us about the medical-industrial complex, but did not realize how intense the disruption would be in health care that the HRI report discusses. This is exactly what the Waitzkin et al. book describes when explaining the methods used by the medical-industrial complex to control and direct the American health care system for power and profit of the members of the complex. Dr. McCanne observes that it is almost as if the physicians, nurses and other health care professionals and the hospitals and clinics in which they provide their services have become a peripheral, albeit necessary, appendage to their wellness-industrial complex that is displacing our traditional health care delivery system and its more recent iteration of the medical-industrial complex. In other words, the physicians and nurses and other professionals have become proletarianized, and the hospitals and clinics merely the places where the medical-industrial complex derives its power and profit from. • Once the silos of the health care system are flattened, how will health care be financed? • Will there still be networks? • Cost sharing barriers such as high deductibles? • Will it be possible to fund this expansive model of the wellness-industrial complex through anything remotely resembling an insurance product, especially when the insurers are being amalgamated into what was formerly the health care delivery system? • And now that the plutocracy is in control, how could we ever remove the passive investors that extract humongous rents through the wellness-industrial complex? • And what about the patients? Did we forget about them? It is obvious from his comments that this new health economy is going to be more problematic for providing universal health care to all Americans and will only make things worse. His Rx is to begin now to move to a single payer, Medicare for All program, and not worry about what has passed. This entry was posted in acquisitions, Aetna, Capitalism, commodification, Consolidation, Cost Shifiting, Cost-Sharing Reductions, CVS Health Corp., EHR, Electronic Health Records, Employers, financialization, Health Care, Health Care Costs, Health Insurance, Hospitals, Insurance, insurers, libertarianism, medical care delivery, medical-industrial complex, Medicare Advantage, Medicare for All, mergers, partnerships, payers, pharmacy benefit managers, physicians, pricing, proletarianization, Providers, Single Payer, value-based care and tagged Aetna, Albertsons, Amazon, Apple, Bershire Hathaway, Cigna, Consolidation, Cost-shifting, CVS Health Corp., DaVita, disruptors, employer activists, Employers, Express Scripts, Health Care, Health Care Costs, health retailers, Health Transformation Alliance, HTA, JP Morgan, medical-industrial complex, Medicare for All, new health economy, Optum, Single Payer, technology invaders, vertical integrators, Walgreens, Walmart, wellness-industrial complex on May 7, 2018 by Transforming Workers' Comp.